Practice kicking goals almost anywhere with the simplicity and ease of the Franklin Sports Portable Blackhawk Soccer Goal. Great for training or a quick game, this Franklin Sports soccer net is made of durable fiberglass and steel for construction that s strong yet easy to put up and take down when needed. This pop-up soccer goal comes with tie-down ground stakes to provide added stability and makes an ideal soccer goal for all ages. Plus, with its affordable pricing and portability, you can order more than one and turn any spot into a soccer field. It makes a great goal net for neighborhood games, team practice, or just a quick game with family or friends! DURABLE CONSTRUCTION: Our durable, weather-resistant soccer goals make practicing shots fun and easy. Now you can take a pop-up soccer net anywhere with the confidence that it will last, season after season. PORTABLE TRANSPORT: The fiberglass and steel construction add stability while being easy to set up and take down. The included carrying case makes it easy to take this portable soccer goal anywhere for team or backyard practice. EASY TO SECURE: This portable soccer goal includes tie-down ground stakes for greater durability. 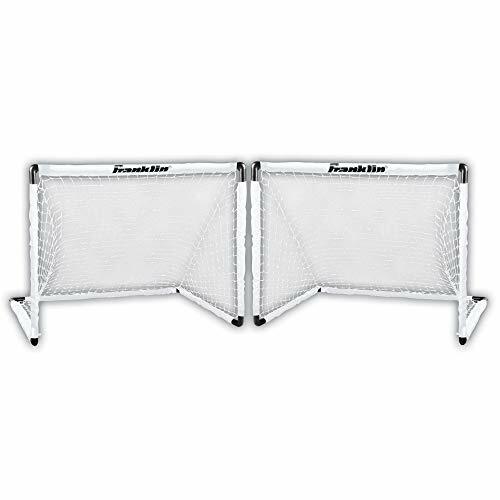 Prevent the wind from blowing away your soccer net, thanks to the stability of the Franklin Sports Portable Soccer Goal. USE ANYWHERE: Take this portable soccer goal almost anywhere with pop-up simplicity. 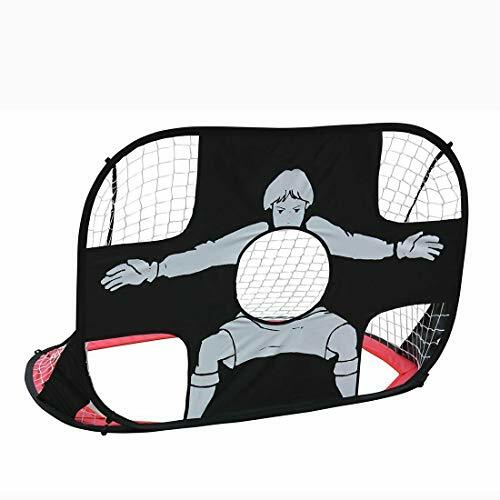 Practice quickly and easily with this portable soccer net, which is great for teams or practice at home. Brand: Franklin | Manufacturer: Sportsman Supply Inc.
Franklin Sports MLS Youth 2 Goal Set features two 54" goals and 8 ground stakes. Perfect for backyard, park or field play. Goal size: 54" X 36" X 20". The GoSports Pop-Up Soccer Goals are designed to provide the ultimate pair of portable goals for training, scrimmages or games. The set includes 2 Goals (choose from 2.5ft / 4ft / 6ft widths) that fold flat and weigh under 3 pounds total. The goals do not require any assembly, but rather 'pop' open for immediate use. To close them, you simply twist and fold them into a flat shape and store them in the included carrying case so they can be taken anywhere. The goals are made from premium nylon fabric and netting that can withstand even the strongest shots. The goals can be staked into the grass using the included stakes, or can be taped onto the ground if you are playing on a hard-court (tape not included). The goals are lined in a high-visibility reflective fabric so they can be used in low-light conditions. These are great for many different applications: youth soccer games, goalie-less games, skills training, backyard setups and more. The set also includes 6 training cones that allow you to mark the 4 corners as well as the field half. The goals come with a full GoSports lifetime warranty and US based customer service, so we are here to help if anything goes wrong. FULL SET: Includes 2 Goals, 6 Cones & Carrying Case! 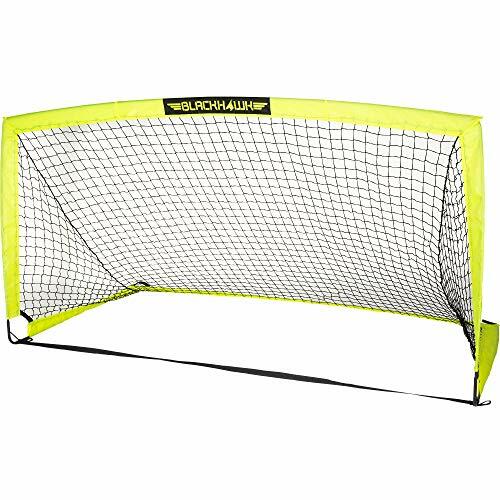 Play soccer anywhere, anytime with the lightweight, portable Sport Squad Soccer Net Set. Whether your training, practicing your shot or looking to have some friendly completion with family and friends, the Sport Squad Soccer Net Set can do it all! Made out of lightweight materials and accompanied by a compact carrying bag, you can see how many different places you can play in one day. Take the portable nets to the park, the beach, your backyard or your next family get-together! These nets are play-ready and assemble themselves by springing open. Secure them into the ground with the included heavy-duty steel stakes and you re ready to dominate the soccer field! The nets collapse, fold and store in the included compact carrying bag, so you can easily transport them to your next destination. Sport Squad games are made to bring family and friends together. It s time to put down the screens and enjoy some interactive fun! 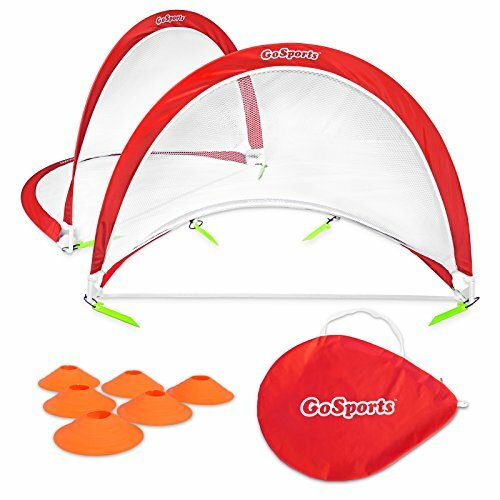 SOCCER ON THE GO: Collapsible and lightweight set of soccer goals perfect for spontaneous soccer games anywhere! 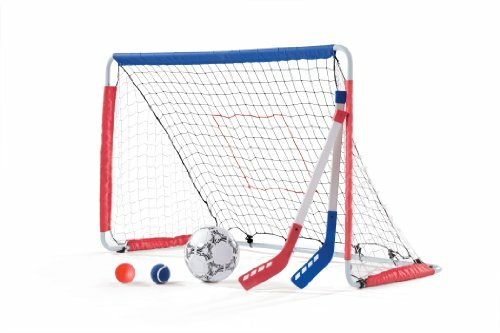 PRACTICE & RECREATIONAL USE: The perfect portable soccer net set for training, practicing drills or having a fun-filled game of soccer with friends in the backyard, park or even the beach! 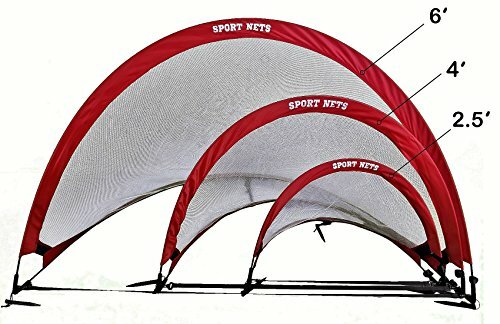 Sport Nets Portable Soccer Goals are the ultimate pair of pop-up goals for training, games or practice. 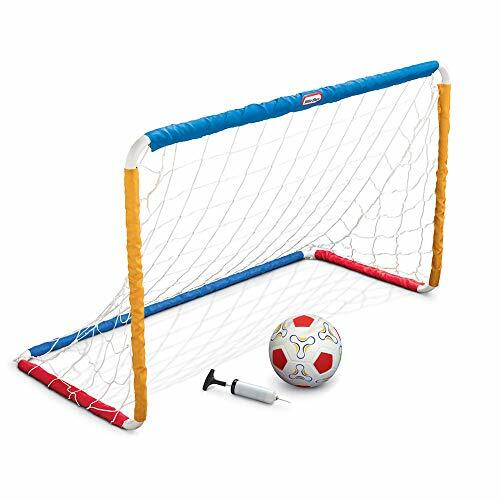 The goals come as a set of 2 nets with 3 ground stakes and a carry bag. They are light weight, easy to setup, take down. No assembly required. Simply take the net and twist at the corners and you can turn the net flat to slide into the included bag. All Sport Nets come with a Lifetime Warranty, so you can buy with confidants. Sport Nets in located in the South Carolina and has US customer service should you have any questions or need support. We are here to help. 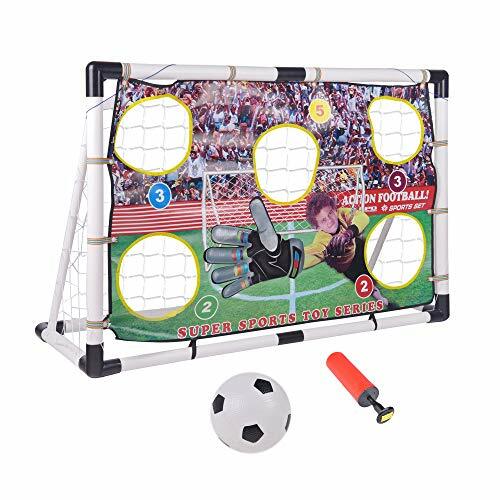 GOAL BEST USES Soccer Practice, Backyard soccer drills, pick up soccer games at the park or beach or anywhere really, its portable and travel sized! 3 SOCCER GOAL SIZES - Available in 2.5', 4' and 6' Wide - All nets come with 3 ground stakes - perfect for all ages, toddler, youth, teen to adult. LIFETIME WARRANTY We are here in the United States with US Customer Support. Satisfaction Guaranteed. The Gharpbik Soccer Goals are designed to provide the ultimate pair of portable goals for training, scrimmages or games. The set includes 2 Goals (choose from 2.5ft / 4ft / 6ft widths) that fold flat and weigh under 3 pounds total. The goals do not require any assembly, but rather 'pop' open for immediate use. To close them, you simply twist and fold them into a flat shape and store them in the included carrying case so they can be taken anywhere. The goals are made from premium nylon fabric and netting that can withstand even the strongest shots. The goals can be staked into the grass using the included stakes, or can be taped onto the ground if you are playing on a hard-court (tape not included). The goals are lined in a high-visibility reflective fabric so they can be used in low-light conditions. These are great for many different applications: youth soccer games, goalie-less games, skills training, backyard setups and more. The set also includes 6 training spikes that allow you to mark the 4 corners as well as the field half. The goals come with a full GoSports lifetime warranty and US based customer service, so we are here to help if anything goes wrong. 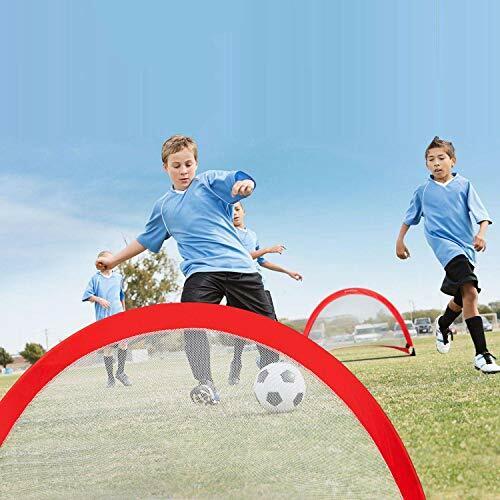 ANYWHERE ANYTIME Develop and sharpen your kid's soccer skill by letting them play in backyards, public fields, deserted lots, parks, gymnasiums, and any free room big enough to pass between a couple of goals using our portable soccer goal. STABLE, STURDY & DURABLE The soccer goal is made of high quality solid fiberglass poles for extra strength and flexibility while reducing the overall weight. Made of strong fabric & reinforced mesh, the soccer net withstands the ball constantly hitting it. Metal spikes hold the goal firm to the ground. EASY TO ASSEMBLE Set up & pack the pop-up soccer goal in no time - untie the strap & the goal just pops up. To pack, grab the corners of the goal, twist counterclockwise & secure the corners with a button. Can be easily installed on concrete floors too by securing the frames to the ground using weights or sandbags. VALUE FOR MONEY Improve your kid's speed and agility when playing soccer using our soccer goals and nets that comes with 6 spikes(not contain cone), - let the kids play the real game against each other. All these can be packed easily & neatly in included CARRY BAG! 1 YEAR WARRANTY Our frames, metal and composite parts are covered with a 1-year warranty. We ensure that all products arrive to you without defects. Our Soccer goal is not only for normal soccer shooting but also for special training of aiming. And, you can also play lacrosse or hockey. It's family-friendly, perfect for parent-child games, so you can enjoy more family time with your kids. [2 in 1 Design] The soccer goal design with 2 sides. One side is normal goal for soccer,football,baseball, lacrosse, hockey and more. The other side has 5 target areas for practicing and improving children's balls target accuracy. [Pop Up Soccer Goal] Set up without tools. Easy to fold back to the storage bag and save space when no in use. Portable design allows you to carry to anywhere for playing or training. [Durable Soccer Net] Our soccer goal for kids is made of strong and durable waterproof oxford fabric, easy to clean. All rods and iron bars are sturdy enough to ensure your kids safety. 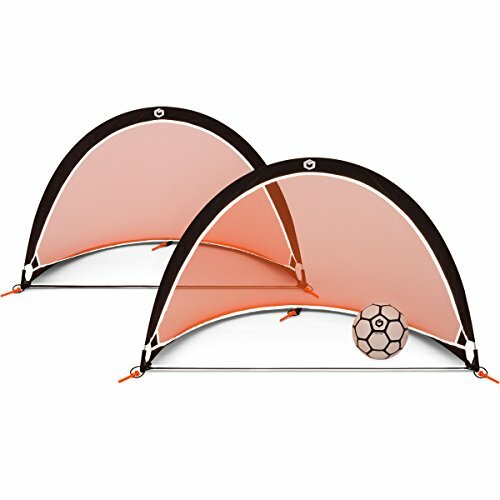 [Multi-Functional] This kids soccer goal is perfect for outdoor activities, such as camping, beach party and others. Also suitable for backyard, park, basement, home. [Best Gift for Kids] Excellent birthday or festival gift for your children. Kids can have more soccer fun with their friends or classmates. Playing soccer game not only brings happiness to children and also helps develop their team spirit and social skills.